In Connie Gonzalez (Catherine Castellanos, left), Norma McCorvey (Sara Bruner) finds love and stability, two things that have been hard to come by in her life. Some things you should know about Sara Bruner, the OSF actor who played both Viola and Sebastian in last season’s Twelfth Night and Norma McCorvey, a k a Jane Roe, in the premier of Roe. She first appeared onstage in the guise of an appleseed. The Missoula Children’s Theatre came to her small town of Deer Lodge, Montana, and as is the custom, two professional actors organized a production about Johnny Appleseed casting the local kids according to the sizes of the available costumes. Bruner was four years old. Her grasp of a character is as much physical as it is textual; it's often through physical posture that she understands identity. No one in Bruner’s family had gone to college, and though active in theatre, she’d made no plans for education beyond high school. But a friend was driving to Boise State University to audition for a theatre scholarship, and on a whim, she accompanied him and auditioned as well. She was awarded a scholarship. One year into the program, she decided to audition for the Idaho Shakespeare Festival. For the practice. She didn’t know what regional repertory theatre was, and she’d never performed Shakespeare before. She chose Phoebe’s monologue from As You Like It, unaware that every young woman auditioned with the piece. She was invited into the company on the spot. Initially, she was oblivious to the implications of her success; similarly, she took it in stride when director Bart Sher immediately cast her as Miranda in the Festival production of The Tempest. What she did realize was that acting could actually become a career, one that suited and challenged her talents, one that inspired her passion. Though she did eventually complete her degree at Boise State, she performed with the Idaho Festival for seventeen years. It’s the honoring of contradiction, the transcendence of a binary, we/they perspective not only on the abortion issue, but also on matters of sexuality and class, that Bruner finds most valuable, most truthful in Roe. In this regard, the contemporary play models Shakespeare. In the nineteenth century, when the poet Keats articulated his concept of negative capability, he was thinking of Shakespeare and his genius for entertaining uncertainties, contradictions, and doubts without insisting on a singular resolution. Not surprisingly, Bruner proclaims her love of “every single syllable of Shakespeare”—or to use her phrase, she “nerds out” on his language. The 2016 Twelfth Night marks her third production as Viola, but it’s her first playing both Viola and her brother Sebastian. It has thus become her favorite for the way it puts the Bard in “conversation with gender issues” and embodies paradox without presuming to resolve it. Bruner’s approach to a role is largely intuitive, fluid, dependent on the play. Her grasp of a character is as much physical as it is textual; it’s often through physical posture that she understands identity. Recall the expressive range of her Olympic leap over the deck chair in Twelfth Night and her sneaking a childlike snuggle against the Duke’s barrel chest. In Roe, she climbs on furniture in manic attempts to escape the prison of her life then hugs a child with tender intimacy. Has it been too smooth, this career path of Bruner’s? It led her straight to her tribe, as she put it, and she fell into its mentoring embrace. Those of us who have seen her onstage understand that this was not some sort of bizarre coincidence. Still, because she cannot point to deliberate initiatives on her part, she worries that it might all disappear as mysteriously as it came to be. She thinks about Sarah Bernhardt, who met a young actress right before she, Bernhardt, was to go onstage. When the younger woman mentioned that Bernhardt’s hand was trembling when she shook it, Bernhardt explained that she was afraid. The younger woman expressed surprise; she herself wasn’t afraid before a performance. Once you’ve performed long enough, Bernhardt replied, you will be afraid. Fingersmith breathes subterfuge. Peopled by pickpockets and con artists, its action descends a rabbit hole of nefarious plotting. The central characters are all involved in tricking each other, and although they continually break the fourth wall to address us, we can’t rely on them to speak the truth. One of the world's most precious volumes starts a tour on Monday, in Norman, Okla. The Folger Shakespeare Library in Washington, D.C., is sending out William Shakespeare's First Folio to all 50 states to mark the 400th anniversary of the bard's death. 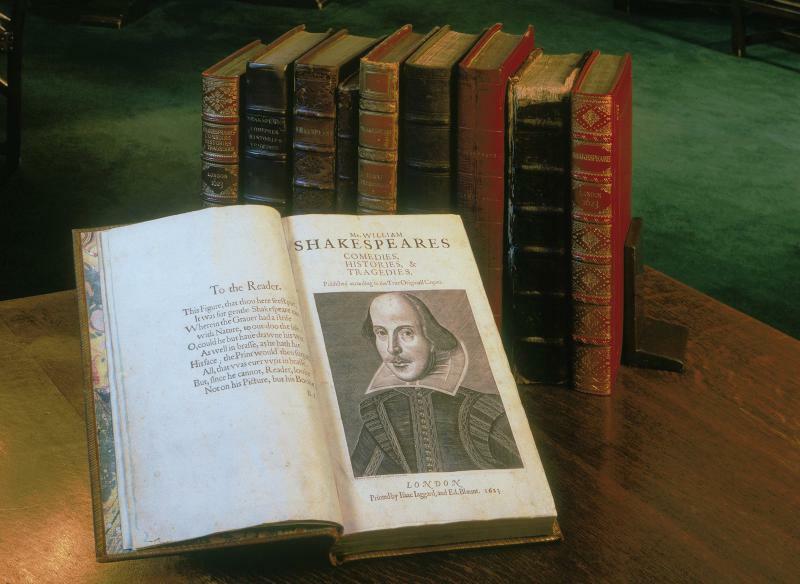 Published seven years after he died, the First Folio is the first printed collection of all of Shakespeare's plays. Julie Felise Dubiner and Robert Goodwin discuss the staging of "Roe." It might be the most famous lawsuit of all time: Roe vs Wade. You only have to say "Roe," and people instantly understand you mean the case that made abortion legal, with limitations, in the United States, in 1973. Which probably explains why the Oregon Shakespeare Festival's new play on the suit and its implications is called simply "Roe." The play is the latest to premier in OSF's ongoing "American Revolutions" cycle of history plays. Actors strive onstage to “tell the story” laid down by the playwright and envisioned by the director. In an illuminating new book by Mary Z. Maher and Alan Armstrong, Telling the Story, twelve actors from the Oregon Shakespeare Festival have been invited to contribute to a different narrative, one that takes place before and behind the scenes. This composite account begins with the circumstances that propelled them into acting then describes the multi-faceted, idiosyncratic processes, which, leavened with dashes of luck, have supported their onstage success.